Competition time! Enter below for your chance to win a Turn Wine Decanter 1L (RRP: £36.50). The remarkable Turn Wine Decanter (1L) is hand blown and designed to take aeration a step further. 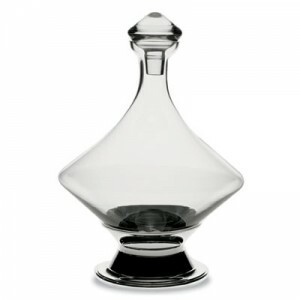 The decanter is purposely and ingeniously designed like a ‘spinning top’ and is a welcome addition to any table setting. Not to mention eye-catching. It can be easily removed from its stand and gently rolled in arc which helps renew the surface area of wine exposed to the air whilst speeding up breathing. Elegant and delicate to look at on your table, love to win this. I can almost see myself using this and making sure everyone else can see me ! ! Thanks for all the entries so far, keep them coming! Wow – Very Nice !!! Recently broke my cut glass decanter. This was one of the few prizes I had ever won in a golf competition. Would decorate any disply unit in the house were it a side board or a glass display unit is situated. An item that would draw attention to any guest having dinner in the dining area of any dining Room. Love it! Love it! Love it! Looks so stylish. This is a lovely prize, would be ideal for me though the wine wouldn’t stay in it for long!! Roses are red…and so is my favourite wine! It’s a joy to behold and functional too. What a stylish design. Would love to bring this out at my next dinner party. Really love the shape of the glass, it’s very unusual and would make an excellent compliment to any table along with a feast, standing high above in all it’s glory. what a beautiful decanter. I would love to win this. My ships decanter broke a while ago, this would make an ideal replacement. Very elegant – as well as practical….